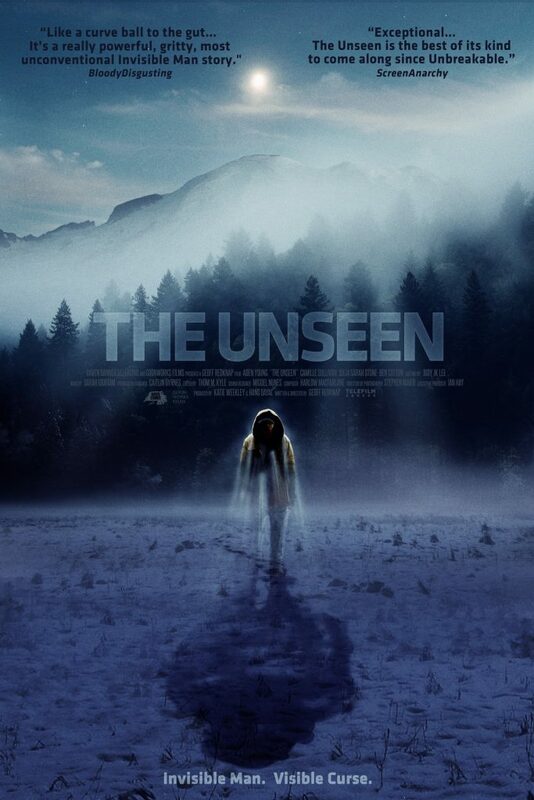 While his protagonist is slowly vanishing, makeup effects veteran turned first-time feature writer/director Geoff Redknap receives more exposure this week as his sci-fi thriller THE UNSEEN sees release. We’ve got an exclusive, in-depth chat with the filmmaker about his fresh look at a classic character. Prior to tackling THE UNSEEN, Redknap has won numerous awards for his short-film work to go with his long effects résumé. His credits in that field range from numerous episodes of THE X FILES and SUPERNATURAL to features such as THE CABIN IN THE WOODS and the DEADPOOL films, along with more recent series like A SERIES OF UNFORTUNATE EVENTS. More than just a showcase for that craft, THE UNSEEN announces Redknap as a filmmaker concerned with character drama in bizarre, occasionally frightening situations. RUE MORGUE spoke to him following the movie’s world premiere at Montreal’s Fantasia International Film Festival. Out of the many stories you could have told in your first directorial feature, given your background in effects, what led you to choose this one? It came from thinking of something we could do on a lower budget; starting out, it’s always lower-budget. I draw from childhood and the films I grew up on, and I was certainly into the Universal monster movies, and I was thinking about, what haven’t we seen lately? You know, we go through the cycles of vampires and werewolves and remakes and reboots, and I feel like I just dreamed it up one day. I woke up and thought, “An invisible man, we haven’t seen that in a while.” And then, what could we do with that idea that could be different? Well, most people would approach an invisible-man story nowadays as purely a visual-effects movie, so with my makeup effects background, what could I do that would bring that into the equation? Katie Weekley, our producer, posed a great question early on: If we’re going to find a leading actor who can carry this role, and will have a look and be the face of the film, how do we do that if he’s invisible—five minutes into the movie, he’s not on screen anymore? Based on that, the idea of progressive invisibility came up, a condition that is getting worse and worse, and instead of him becoming more and more transparent, it’s piecemeal and patchy: fingers disappearing, holes in his face. That’s really how my background fueled the concept. Almost all of the classic invisible-man films, even James Whale’s original, have comedic elements, while THE UNSEEN is very serious throughout. Yeah, that’s kind of my thing. OK, I did a short called THE AUBURN HILLS BREAKDOWN that was very much a comedy-horror blend, but most of my films have been quite serious. My recollection of Universal’s INVISIBLE MAN series is that they got progressively funnier; there was humor in the first, and then they started getting crazier, and in the later one he’s a secret agent, I think. They became more comical, more slapstick. We did try to inject a little bit of humor into THE UNSEEN, and watching it at Fantasia, the first screening with a large audience, I was pleasantly surprised to hear the laughs, in places I didn’t necessarily know there would be laughs. I wouldn’t say I took any humorous influences from the original movie, but I did take some ideas from it, and more so from the book, H.G. Wells’ THE INVISIBLE MAN. I forget exactly where in the process, but I think I was rewriting the script and decided I should read Wells’ novel and see if it inspired anything. The first thing I discovered was that there was a lot of stuff in there that just naturally occurred in my script. Maybe it was subconscious, from memories of the book or the films. Even the title—originally, we called it UNSEEN, and then reading the book, we noticed again and again that they referred to “The Unseen.” I think I did a Google search, and it comes up 27 times or something. It’s interesting, because the book uses it in different ways; it refers to the invisible man as “The Unseen,” and he refers to himself that way, but I think at times he calls the condition “The Unseen.” It sort of changes the meaning, but uses that same phrase. When we made that connection to the book, we thought we had to add THE in front of UNSEEN. Once you had settled on doing an invisible character, how did you build the story around that, especially given that the invisibility isn’t part of the story for a while, before we learn what his condition is? Actually, a review referred to it as a subplot, which I thought was pretty spot-on. When we were making the film, I never considered it a subplot, but somebody taking that perspective on it makes total sense. Once we came up with the idea of doing an invisible-man story, the next step was, what hasn’t been done? That immediately fueled taking away the typical elements, the predictable elements. The first thing to go was the idea that it was a science experiment gone wrong, or a mad scientist or a laboratory or any of that, like in HOLLOW MAN, where it’s a government lab. We wanted to take that out of the equation and see what we came up with. So we moved our invisible man into being the least likely candidate—a retired hockey player, now a millwright working in a sawmill in a small Northern town. But there’s an explanation for that: When his condition presented itself, he had to hide it, so he needed to be somewhere where people wear lots of heavy clothing, gloves and hats most of the year. I thought that a millwright in a sawmill would always be wearing gloves, he would always be wearing coveralls. His main goal through the whole film is to hide it, to protect himself and his family. He leaves his family to protect them from his problem. THE UNSEEN has a handheld shooting style, and that doesn’t lend itself to digital effects work, so how did you reconcile the two? Well, we were a lower-budget film on a really tight schedule, and one thing I remember is that we moved almost every day. Like, every shooting day had two locations in it, at least. There was one stretch where we did five days in one place, and that was kind of a luxury. Every other day, we were moving, so it was a real run-and-gun crew. I wouldn’t say everything was handheld, but going in, that was the mandate. Even if the camera’s not moving, it’s still going to be held, not mounted. There were a few times when it needed to be, and our visual effects supervisor, Bob Habros, told us that handheld is OK for that work, as long as it’s not what he referred to as a nodal move. If the camera just tilts up and down, or pans left and right, that’s OK. If it moves forward or backward, then you’ve got a different battle. The reveal shot of Bob, when he shows himself, was very much planned from the beginning. Bob Habros told us, “If the camera stays in one place and he moves, that’s great. If the camera moves around him while he’s doing this, you’ve got a much more challenging shot.” So things like that influenced our approach. But on the other side, we did a lot of it practically. And if it’s a makeup effect happening, that takes away the problems of 3D tracking and comping. A lot of it was really there on set, to be filmed from whatever angle, with the camera moving. Do you recall any shots as being particularly difficult? We did this crazy single-take tracking shot where we followed Aden into the mill, and all the way through till he got to his locker. We ended up cutting it down into pieces in post, because it was just running too long. But there is one moment when he walks in through a door and has to stop on a catwalk and let five guys walk past him. They were totally real workers, and we didn’t know they were coming, because we had started the take a minute earlier outside the mill, and we didn’t have location assistants locking up every little nook and cranny. So by the time we got there, these guys were going off to lunch or a shift had ended, and they just walked through our shot, and Aden, of course, just stayed in character and hesitated for a moment, let ’em pass and then went on. It was perfect. Did you have to balance work on THE UNSEEN with your makeup effects gigs?